I had just consumed a pitcher of beer along with too many Chinese-German sausages at the Tsingtao Beer Museum, when I received the email from an editor asking if I had some thoughts about gluttony in China. I immediately felt guilty. After all, earlier that day, at lunch, I had splurged on an extravagant $35 seafood buffet in the Qingdao Le Meridien that cost about the same as an average Chinese laborer’s daily wage. In my defense, lunch was a work meal—I operate an international freight-forwarding firm in Los Angeles and was meeting longtime partners for the first time. Dinner was more of a dare by a Tsingtao Beer Museum employee who enjoyed goading one of the few visitors to Qingdao, a seaport city, in its tourist off-season. 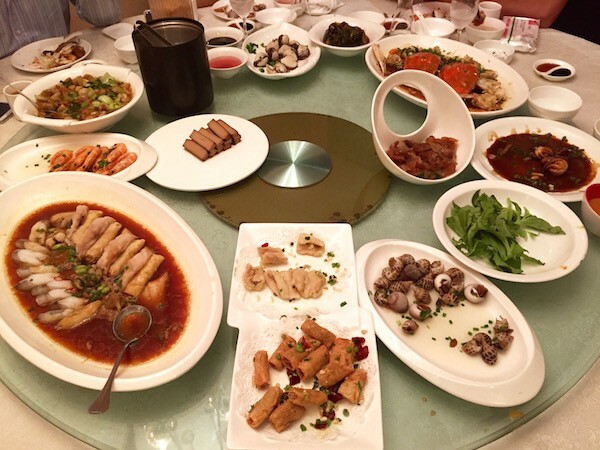 The idea of gluttony in Chinese culture is an extremely muddled issue. I know this from my frequent trips all over China, Hong Kong, and Taiwan for the last 20 years. These trips have all involved serious eating and drinking of one kind or another, and have made me interested in the stories behind the meals and beverages I’ve enjoyed. There is no direct translation for “gluttony” in Chinese, not in the colloquial sense. There is certainly no religious law proclaiming gluttony a sin, and there are no Chinese TV shows devoted to ingesting superhuman quantities of food (see Adam Richman’s Man vs. Food). After all, a good Confucian would not be so crass as to demonstrate such a wanton attitude toward food. But, there are certainly examples of extravagant consumption of food in China. Among the massive cook-outs and eat-ins are attempts to set world records for the most people eating breakfast in bed, the largest serving of fried rice, the largest piece of tofu, and the biggest stuffed bun. From what I’ve seen in China, it’s not really about eating for the sole purpose of bodily pleasure. At a recent dinner I had, a group of Sichuan foodies mocked the idea of American gluttony and proclaimed themselves merely lovers of mei shi, “beautiful food.” More often than not, laying out an extraordinary amount of food demonstrates pride, relationship-building, and mian zi—face, the social concept of prestige. If gluttony ever existed in China, it was reserved for the emperor and the royal court, much as it was in countries across Europe. History books describe extravagant imperial meals that were fit only for the emperor—and maybe a few of his concubines. The most famous imperial feast was “Manchu Han Imperial Feast,” a three-day banquet in 1713, thrown by the fourth emperor of the Qing Dynasty. It was the emperor’s 66th birthday and he had just conquered one of his greatest rivals and brought about national unity. 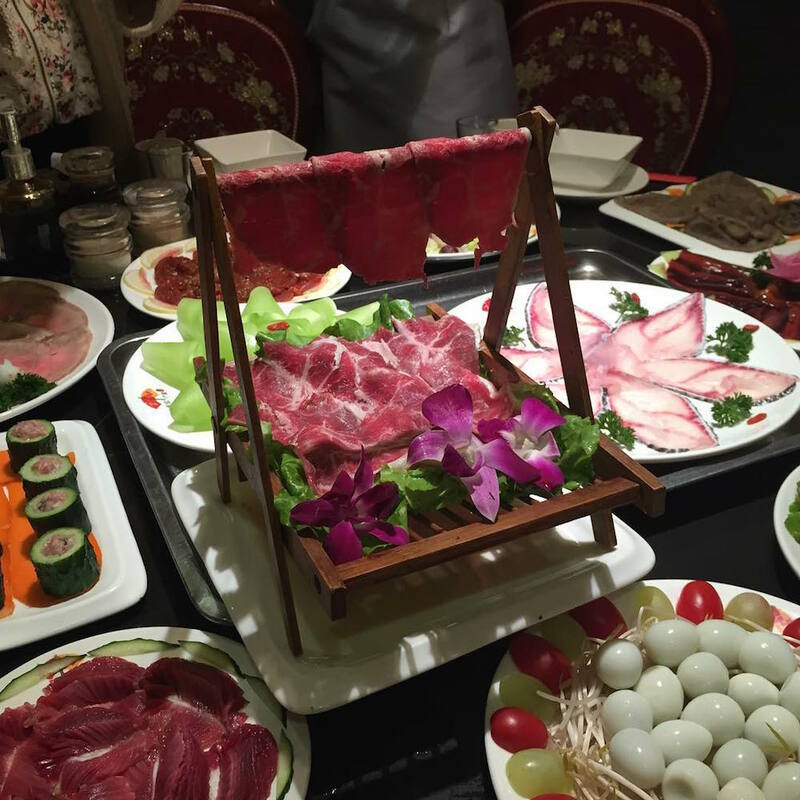 To celebrate, there were 108 dishes from six distinct regions of China, including not only beef, pork, mutton, and venison, but also the creative use of ape lip, pork brain, and leopard fetus. To this day, some Beijing restaurants still serve mock “imperial” feasts. The Chinese commoner’s diet, however, stayed pretty bad for a long time. After the Qing dynasty was overthrown by the nationalist Kuo Ming Tang democratic party in 1912, the government threw immense resources at combating Westerners, Japanese, and fractionists—but not at feeding people. Things definitely got worse when the Communists booted the nationalists off to Taiwan after World War II. Despite benign sounding name, Mao Zedong’s Great Leap Forward campaign caused severe famine and millions of deaths from 1958 to 1961. No one ate well except Chairman Mao, and perhaps his many mistresses and “nurses.” During the Cultural Revolution, which lasted 20 years, the elite and intelligentsia fled—and, of course, so did their chefs. So, why do Americans think of the Chinese as heartless eaters of all things? Blame it on President Nixon, who dined at the Great Hall of the People in 1972, an event broadcast live on the major U.S. networks for three hours straight. The Great Hall was not normally used for dining, but the Chinese Communists rolled out the red carpet in an effort to persuade the American TV audience that their country was not impoverished. President Nixon and Prime Minister Zhou Enlai dined on shark’s fin soup, black mushrooms with mustard greens, spongy bamboo shoots in egg-white consommé, and fish fillets in pickle wine sauce. Americans were smitten. Chinese cuisine, and all those dozens of plates appearing simultaneously on a giant round table, became associated with gluttony, never mind that this was a special display of showmanship. When, in the ’80s, Deng Xiao Ping decided it was cool to get rich or die tryin’ while still being Communist, a huge wave of poor people became rich, and the middle class blossomed. With money came the desire for nose-to-tail pork and the explosion of a foodie culture, especially after Jiang Zemin’s 1993 push to turn China into a severely regulated capitalist country. We’re not talking about an American-style obsession with food, driven by Yelp and Guy Fieri. We’re talking about a population even larger than that of the U.S. that suddenly had enough income to buy meat. In the last decade, billions of dollars in chicken feet and pork hocks have been imported from the United States to China to meet the growing demand. I saw a kind of arms race develop in the realm of business meals. By the ’00s, a 12-course meal of steamed fish, poached crab with roe, giant prawns with chili and scallions, braised abalone, giant pork hocks, more local fishes done up every which way, and a mountain of fried rice was no longer enough to demonstrate sincerity and interest. Real brown-nosing required four-hour banquets on a Tuesday dotted with interminable toasts of Johnny Walker, Hennessy and baijiu (a Molotov cocktail of a grain liquor usually distilled from sorghum), then a few hours at a karaoke club, then even more liquor. During this time, and in these contexts, American business types were doing serious trades and investments in China; they caught a glimpse of these Chinese schmoozing meals and were shocked. Still, to me, this wasn’t gluttony. This extravagance was about lubricating relationships. Supersize portions don’t exist in Chinese McDonald’s. Buffets are uncommon. Obesity, though said to be steadily rising in the last three decades amongst higher income Chinese, is not commonplace. In fact, the arrival President Xi Jinping in 2013 has curtailed excess in the name of cracking down on corruption. Lavish banqueting was but one symptom of the Communist graft and extravagances that were going on, which also involved parties with prostitutes, multiple wives, and expensive cars. Government crackdowns on extracurricular spending have taken a toll; even Moutai, the most famous of the baijiu in China, has complained of a drop in sales. A Central Party edict might be capable of wiping out over-the-top Communist cadre-sponsored banquets, but it can’t wipe out desire from the population. (Nor can it eliminate the fact that having dinner with a business partner is the best way to build camaraderie. Not everyone can play golf, but everyone can gush over abalone.) Technology has changed China, as it has the rest of the planet—and helped to advance the idea that culinary delicacies are within anyone’s reach regardless of income, and that everyone’s dinner is worth sharing on social media. Major metropolitan areas across China are scrambling to fill storefronts left empty by e-commerce giants. People used to go shopping at the massively constructed malls, but now everything is available on Taibao—the equivalent of Amazon. More often than not, restaurants are moving in. Merchants who formerly trafficked in shoes now sell street snacks from every province. Shoppers are now eaters. Cities prop up dying retail corridors by converting them into colorful “old streets” evocative of street markets filled with nothing but eateries. And in up-and-coming cities like Tianjin—most recently in the news because it was the site of warehouse explosions—entrepreneurs are catering to all strata of society. I passed a street stand that served up food at $1.50 a plate, with bottomless rice, to taxi drivers, who may only eat one meal a day. The restaurant industry is booming so big that Chinese chains like Meizhou Dongpo and Little Sheep are opening up in American cities. Still, this is not actually gluttony. It is simply 1.37 billion Chinese coming to terms with their starved past and even hungrier future. Tony Chen is based in Los Angeles. He occasionally writes about food for sites including EaterLA and LA Weekly. *Photos courtesy of Tony Chen.